†††† — So Much For Substitutes is the new sophomore album from the Canadian foursome downhere. These guys have an awesome sound that's reminiscent of old school Christian rockers U2, especially lead singer Marc Martel, whose vox is perbono. It's a cross-over sound that's sure to appeal to Secular listeners without compromising on the message of Christ's Love and Salvation. This is a great witnessing tool that all teen missionaries will want in their collection -- for their own enjoyment as much as for sharing with their unsaved friends. It starts off strong and keeps the praise a rockin' all the way to the last. The first track is the hit-worthy single "What It's Like," which deals with why there's pain in the world and how God came down here to see what it's like to be one of us. "Isn't it always the question? / How do you know my condition? / You came down to me to know what it's like / To know what it's like to hurt." The album's title comes from the second track "Stone" -- "So much for fame and things you can lose / So much for substitutes" -- a love song about being like a stone for Jesus, 'cause all His stones become diamonds. So true, so true. This message is complemented by the next track, "Breaking Me Down", which is about becoming renewed in Christ's Love: "Your love's breaking new ground / Changing my every way". "Iliad" recasts the ancient battle made famous by the Pagan writer Homer as the true love story of Christ's Redemption, with Jesus playing the role of Achilles, suffering for the victory over Troy, which here represents Man's sin. I think. To be honest, I'm not sure what the point of this analogy is, but it's a rockin' power ballad nonetheless. "I believe it, I receive it / So forever You'll inhabit me." Creation and the folly of Secular cosmology are tackled next in the upbeat "Starspin": "Surely the heavens declare the glory of God / The open skies proclaim the work of His hands." You'll be singing along with this one, surely! It's a great praise song that proclaims the wonder of the Lord's work. "Feels Like Winter" is a straight-ahead rocker sung from the perspective of someone lost and searching for the touch of Christ, who asks "Could You convince my heart to know You really love me?" This song will really speak to unsaved listeners, who themselves feel "like winter on a perfect summer day." They'll also appreciate the following song, "Walls", a ballad about how the Lord can see through the walls of our vanity. "Walls peeling around me / They were standing so proudly / Can't hold them up to Your light." "Does it make you scared to think you stand for something bigger?" Well, listen to "How They Love Each Other" and get over your fear of Love, 'cause: "When you love, you give / And you can never lose, no never." This one has a groovy bass line to go with the groovy message. The driving tune "Headed" is also about Love -- well, most of the songs on here are, come to think of it. More specifically, it's about how love can turn your vessel around, leading you out of storms and headed toward Christ. Then there's the biting sociopolitical commentary on "In America" -- "They say America never hurts / They say America never cries / Like no one's lost in America" -- which, by taut analogy, likens George W. Bush, our philosopher president, to Marcus Aurelius and warns of a coming antichristian persecution by some not-too-distant Decius, only perhaps to be halted by a new Constantine, whom the increasingly degraded culture, self-satisfied with its own ease and wanton pleasures, will iconically view as a devil. That's some powerful stuff! There's still more pointed commentary on "Comatose", which asks "Are you comfortable being so comfortable?" It's a call for revival, for Christians to break out of their lukewarm coma of soft worldliness, to come back to Christ and be zealous in the war for men's souls. Finally, be sure to keep listening after track 12, "Last Night's Daydream," to hear the not-so-hidden track "Home," which could easily be a hit single. 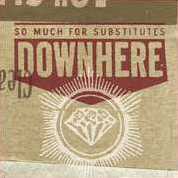 You can get the lyrics and story behind the song at the band's website, downhere.com. Funny thing I noticed in the liner notes: unlike the rest of the band, drummer Jeremy Thiessen forgot to thank either God or Jesus. But hey, that's drummers for you... always forgetting something! For instance, Trevor, our drummer for Zounds, forgot to bring his sticks for our show this year at Martin Yip's Rockin' Chinese New Year Prayer Bash at First Chinese Baptist Church in West Groverville. He tried playing with some chop sticks through most of our set, hoping no one would notice his goof up. We were all like, "Why's the drum so soft? ", and he kept just shrugging like, "I dunno." Eventually we saw the problem and borrowed some proper drumsticks for him from the rec room. Man, did we ever kid him about that one on the way home in the tour van! Anyway, this is a great album that will bring the Good News to even the most jaded Secular music fans.